If you’ve decided to move to a new home that is more suitable for your current needs, you’re probably feeling excited about starting a new chapter in your life. However, for most people facing a residential relocation, the reality of how challenging and tedious moving can be can feel extremely stressful and overwhelming. One of the most tedious (and necessary) tasks in the moving process is the organization and packing up of your belongings. If you’ve lived in your current home for quite a while, you might find yourself feeling amazed with the number of items you actually have inside your home—and with how little of it you actually use or need. With over 20 years of experience in the moving industry, Mont-Rose Moving Systems has helped countless homeowners with specialized moving services to assist in their residential and commercial relocations. Our moving company’s team of experts are extremely experienced in the art of organizing the perfect move—which is one of the most important aspects of successful relocation experience. In this guide, we’ll go over some of the benefits of decluttering your home before the move, and offer some effective tips for a lighter, more streamlined moving experience. Cost-Efficiency: When you talk to move coordinators, one of the factors that will determine the rate of the service is the number of items you’re bringing with you, or weight of your belongings that will be transported. Decluttering means you will bring fewer items, or a lighter load, and therefore, the costs of the move will be reduced. Save Time: The more things you have, the longer it takes for you to pack them securely. By selling, donating, giving away, or tossing some of your useless or unwanted items, you won’t have to waste your time packing them at all. More Space: The fewer items you bring with you to your new home, the more space you’ll have. If there are items that you think you’ll still need in the future but would take up too much space, storage services can be an excellent solution to create more space while streamlining your move. Sell or Donate: As you declutter, you will surely find items that can be donated to charity or sold for extra cash. Whether you decide to do one or the other—or a little bit of both—you’re certain to feel great about your decision to let go of what no longer serves you. 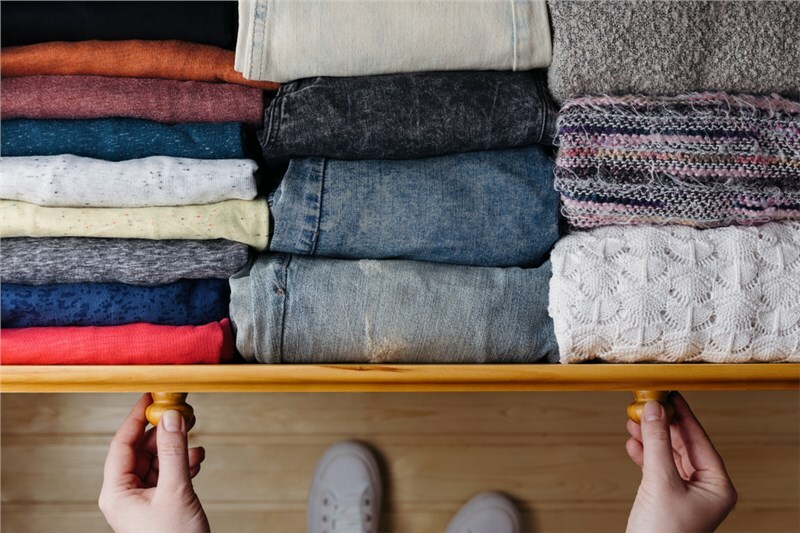 Decluttering can be an exhausting and time-consuming task, but these tips will help you accomplish this task more easily. Dedicate Enough Time: Plan your decluttering project weeks before the move date. By doing this, you will be able to have enough time to decide which items to bring, which ones to get rid of, and which ones to keep in storage facilities. Starting early will also give you time to list your belongings and find buyers if you’re planning on selling them. Use Your Excess Supplies: Whether they’re food items other supplies such as toiletries and household maintenance products, try using up your stockpile of these items so you will have fewer items to bring with you to your new home. Start With Your Necessities: It is important to identify which items you actually need for the day you move in, and to separate these items from the rest of your belongings. Don’t forget to label your boxes, especially the ones containing these essentials, so you will be able to unpack them without having to open each box as you try to look for them. Sort Your Items: Go through all your belongings and categorize them according to which ones should be kept and brought with you in your new home, which ones must be donated to charity or given to friends and relatives, which ones can be sold, and which ones must be thrown away. In this way, you will be able to easily pack all items that you will bring with you. Become a Seller: You can launch a garage sale in your yard for the items that can still be sold because they are in good condition, but you no longer want to bring. You can also try selling apps like LetGo, OfferUp, and Poshmark to list them on the internet for sale. Once you’ve decluttered your home, it’s time to contact a reliable moving and storage company that can assist you with transporting these sorted items to your new property. As a trusted Mayflower Transit agent with more than two decades of experience in providing residential, commercial, industrial, and specialized moving and storage services, Mont-Rose Moving Systems has all of the resources you need to experience a hassle-free, no-stress moving experience. Our team of professional movers, packers, drivers, and move coordinators will assist you throughout every step of the way to ensure that your move is expertly planned from start to finish. For more information on our services, give us a call to speak with a representative now or fill out our online form to get started with a free, in-home moving quote and consultation.